The Battle of Longwoods - the unofficial start of the 1812 season, is an event we all look forward to Despite a little damp weather, all went smoothly - a great time for everyone involved. The Royal Scots do know how to start the season off with a bang – several bangs! Thanks Denise, Darlene, Deb and Sarah! 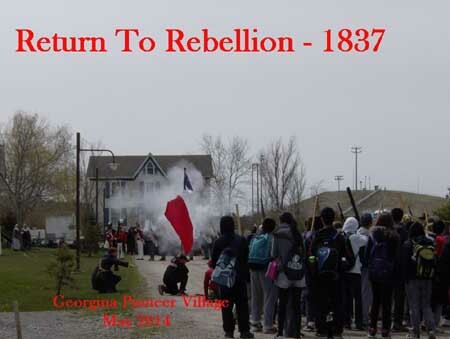 Each year the Incorporated Militia of Upper Canada assists the Georgina Pioneer Village with their 1837 Rebellions School Program. Grade 7 students from the local and regional schools arrive for a half day program to find out about the life of the soldiers and rebels and to hear from the leaders of the time. Actors portraying William Lyon MacKenzie and Sir Francis Bond Head take turns trying to “persuade the citizens of Upper Canada”. The two sides go over their complaints and beliefs of the time. After the debating, they watch as MacKenzie hides and eludes capture by the forces of the Crown. The original IMUC, although disbanded in 1815, were recalled to help The Crown with the uprisings. Two of our members who have had experience with 1812 artillery held a day of Artillery School at Battle field house in Stoney Creek. Several of our members availed of the opportunity to have some initial training on a field piece and to experience the firing close up. We often see, and especially hear the field pieces at events, but they are often in the background. Brent and George worked our people through safety procedures, Crown Forces protocol s and the positions needed to handle a “gun”. We thank you gentlemen for sharing your knowledge and experiences. This weekend, the Friends of Fort Willow and the Royal Newfoundland Regiment organized a "Garrison Weekend" at Fort Willow (Willow Creek Depot) near Minising Ontario. Members of the Royal Newfs, The Glengarry Light Infantry and The Incorporated Militia of Upper Canada set up for a few days of sunshine (finally) and drill. Thanks Dave Cockburn for organizing this first "annual" garrison! The Friends are putting together a youth garrison and this was their kickoff as well.